Hey, all of you Moto folks! Just wanted to give a quick review of my spring break trip with my boys to California. "Why?" You ask? Because we had some of the most amazing Moto moments on this trip and I want to let you all know about them and recommend them if you are traveling in the Golden State. So, I normally don't get to do spring break because it is such a busy time of year for the shop but this year my wife was out of the country working so the rough duty was laid in my lap. I am so thankful that it was because we had a blast. We started off by traveling on Sunday from Montrose Colorado all the way to Buellton California. That is a long day in a van with an 11 and 9-year-old but we hammered down and made it happen. Buellton is North and West of Santa Barbara. You leave the big town and head up a narrow canyon for a way then as it opens up you enter the quaint little town of Buellton. The sign boasts of 4900-ish residents and it is great. We stayed at Pea Soup Andersen's which we found out is a famous old restaurant and hotel that has been there over 90 years. It's a great hotel and affordable at $73/night with breakfast and a pool. We got to sleep quickly and got up early for our first adventure the next day. In the morning we quickly ate breakfast and headed North East into the Los Padres National Forest to meet the brother-in-law of our good friend Anna. Owen met us about an hour out of town in a beautiful valley at a gate to a private road into the forest. We rode 13 miles of tight, twisty, steep road to get to the family's 160 Acre in-holding in the middle of the National Forest. This is where Anna grew up without running water or electricity. It is heaven!!! There are cool trails all over and it couldn't be in a prettier place. Check out the video below for a quick look at our day in this wonderland! The next day was dedicated to beach time and we did it right! 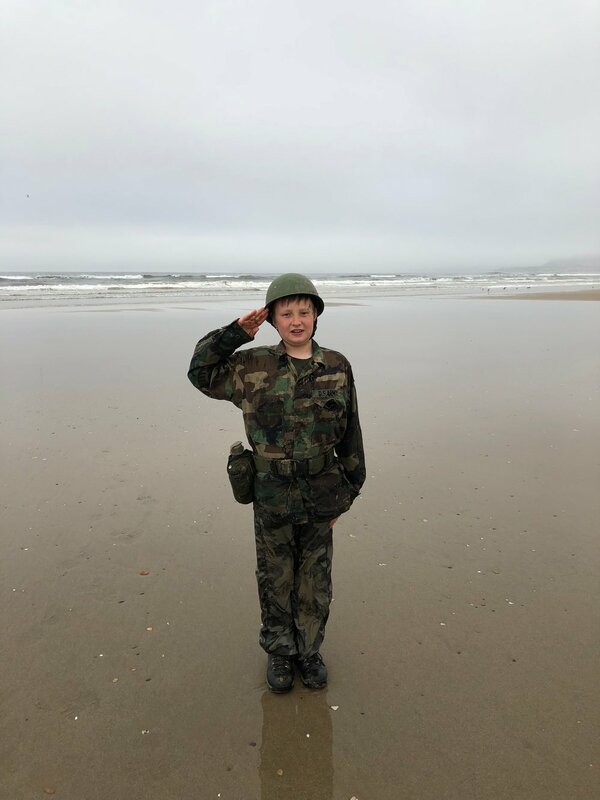 We started by storming the beaches of Oceana Dunes then moved to Pismo for more fun in the frigid water. 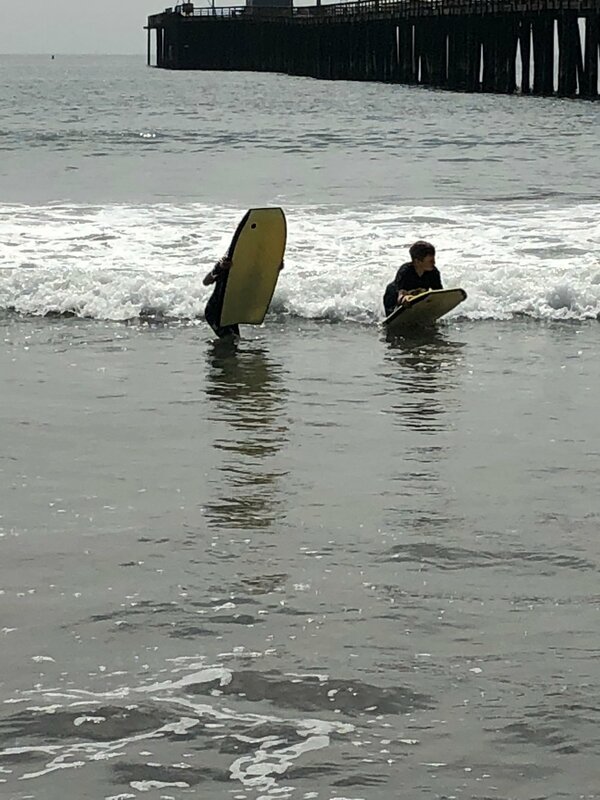 My boys are somehow impervious to the ice-like Pacific Ocean. We rounded out the day in Avila Beach a little further north. This was also the first In-N-Out visit of the trip which is super important! All of the freezing salt water and sand wore us out and we headed back to Buellton for rest and dinner. On the way, we checked out Solvang which is about 2 miles from Buellton and a lovely little Danish Hamlet that was founded by the plucky Danes in 1911. Wednesday dawned foggy and cool like all the rest of the days but we loaded up and headed to Zaca Station MX up near Los Olivos which is only about 10 minutes from Buellton. If you haven't heard of Zaca you need to check it out. It is the setting for lots of Moto Movie segments and is the coolest motocross track I have ever been to. It's kind of like a speakeasy track. There is very little info on the web about it and it took quite a while for me to figure out where it was and when they were open. When we pulled up there were no signs, no banners, nothing but a sprinter van and a really nice lady with paperwork. We filled out the obligatory waivers and stuff and as we rolled away towards the track she said, "The Combo on the lock is $#$# (not telling), make sure you lock it on your way out." What? We drove the long road to the track and found a great parking spot. There were about 40 or 50 people there and it was a very mellow feel. We unloaded and geared up. As we were strapping helmets an old guy walked over and asked if we were planning on riding the smaller track too. My boys piped up "Yep" and he said he would go water it for us. After watering the whole track he came back over and told us to give it a few minutes to dry up and then have fun. A little later the woman who had checked us in pulled up and unloaded her bike and then I realized that they only open the gate for a little bit then it's locked and that's it. No more people. It's like a private track. Only its a private track in the best dirt and terrain I have ever ridden a moto track. We spend the whole day there turning laps on the small and big tracks and it was amazing. I cannot recommend that place enough. It is so refreshing to go to a track that has amazing dirt, perfect grooming, and natural terrain that is amazing and not be overrun with people. It is a special place. Check out our pics and video from Zaca below. 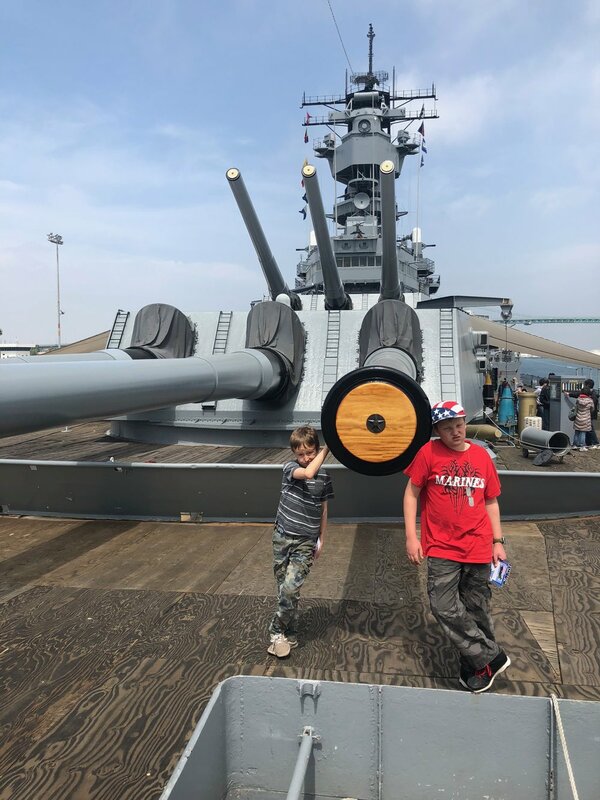 Our last day in California was spent down in Long Beach touring the Battleship Iowa and playing more on the beach. The USS Iowa is such an impressive thing. We just don't have gunships like that anymore and this one is sooooo cool. The tour is a little expensive but worth every penny because it is so interesting and amazing to see such firepower! From there we headed back east to our amazing slice of heaven that is Montrose for a day of rest before school and work started back up. It was such a fun trip and I highly recommend a trip to that part of California. It is so cool and so different from Colorado or anywhere I have ever been. I also urge you to take time with your kids. Life and work so often get in the way and make things hard and stressful but in the end, you will not be sad about time you spent with your family! Get out and have fun everyone! And hopefully you can involve DIRTBIKES!!! !